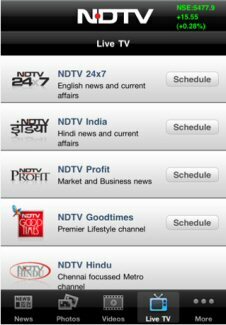 For the last couple of days, we’ve been playing with NDTV 2.0, an upgrade to the eponymous Indian TV news channel’s application for the iPhone 4. We weren’t too happy with the previous 1.1 version of the NDTV app and hoped the upgrade would have fixed some of the shortcomings. Also, the new Live TV feature in the NDTV upgrade caught our attention. Hell, who wouldn’t want to watch a leading Indian news channel live, right? And at 99-cents a month the pricing sounded right to these cheapo desis. So we quickly hit the subscribe button for NDTV 24×7 , the English news channel, even though we were – and still are – unclear as to how we’d be charged (whether by our iPhone carrier AT&T or by Apple iTunes). Like its predecessor, NDTV 2.0 too is work in progress. This time, our main interest was the Live TV feature and so this review focuses on that aspect. We tried Live TV on both WiFi and 3G. On WiFi, the application works mostly but crashes on a few occasion. When Live TV works on WiFi, the quality leaves a lot to be desired. Frequently, the sound doesn’t come through on the iPhone 4’s built-in speaker forcing you to use the headphones. Then, there’s the crucial picture quality, which is often bad. Sometimes the image just freezes for a few seconds and at other times gets too blurred to be even watchable. On 3G, the reception is terrible. We tried it at different places including in a Philadelphia suburb yesterday and at home a few minutes back. The picture quality is mostly awful and the application keeps crashing. Bottom line, NDTV 2.0 has been rushed out by Indian software developer Robosoft with scant regard for quality. SearchIndia.com recommends that you do not subscribe to NDTV 2.0, at least not till unless the bozos fix the application.